At the same time I was overcome with this sense of relief and inner knowing this was the right answer and knew that meditation would then forever be part of my life. I now consider it to be my way of talking to The Universe. 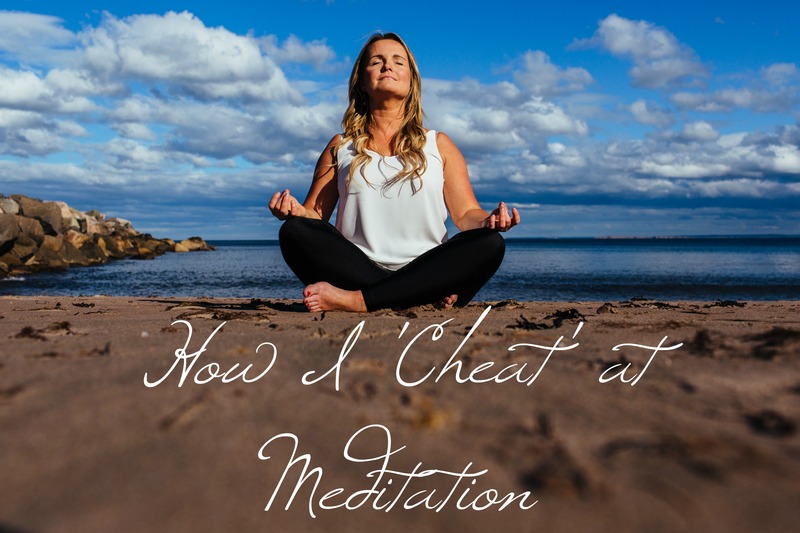 Even though I've been meditating for quite a few years I still think of myself as a 'cheat' at meditation because I haven't actually mastered sitting still in a chair with my feet on the floor in complete silence. I like to lie down and listen to meditation tracks because I find it more relaxing. Sometimes laying down isn't an option so I just try to find a comfortable position wherever I happen to be. My first experience with mediation was when I ordered the sample Holosync cd from CentrePointe. It explained in great detail the benefits of meditation and the Holosync program and then provided about six minutes or so of a sample meditation track. I would listen to those six minutes then rewind and listen again and again and I honestly felt the benefit from just the free sample track. Since then I've invested in a few meditation programs, but I've also recently finished the free 21 Day Meditation Challenge from the Chopra Center. I was having one of those rare weeks where I felt like I wasn't quite myself and a little down. I can honestly say that simply starting Day 1 of the challenge snapped me out of my gloomy state. That's how powerful mediation can be. My son even enjoys listening to soothing tracks when he has trouble getting to sleep and used to call it 'medication'. He's not far from the truth there. I'd also recommend a great video series by my good friend, Dr. Michael Brant DeMaria. He has a free 7X7 Meditation Challenge on YouTube and it's perfect for getting me back into meditating if I've been away from it for a while. Michael has the most relaxing voice and presence of anyone I know. As a 4-time Grammy nominee it's no wonder his accompanying music is also phenomenal. Listen: Guided meditation tracks (someone talking over relaxing music) is a perfect way to get started into meditation because their words will help keep you from drifting off into your own random thoughts. Block: Use headphones or earbuds to block out surrounding noises like traffic, voices, machinery, etc. Announce: Let whoever you live with know you're going to meditate so you're not disturbed. Go Dark: If your room is too bright once you close your eyes wear an eye mask. Ignite: Light a candle and set an intention for that day's meditation as you light it. Unplug: Turn off text, email and social media notifications on your phone. Create A Space: Create a sacred space that feels special to you. Mine includes candles, small items of personal importance, crystals and a few photos. However, don't wait until you have the 'perfect space' set up before you get started. Release: Let go of expectations of how to meditate correctly. Just get started on the journey. I still consider myself very much a novice on this journey so if you have any tips you want to share or the process you follow I'd be grateful if you left a comment below.